“Business agility” is both, goal and requirement for the future in one. Businesses need to become agile in order to be able to adapt to the rapid changes in markets, industries, technologies and peoples priorities. After frameworks and methods in IT were adopted from the automotive industry (Kanban, Kaizen, etc.) and tried for several years more or less successfully, the problems with “changing goals” midway, eventually became too painful to tolerate. Back than the speed of change in a project was about 4 month. To allow for more flexibility and increase speed, “agile” methods were developed and introduced. This was the first wave of agile, and the speed of change in a project shortened to two weeks. 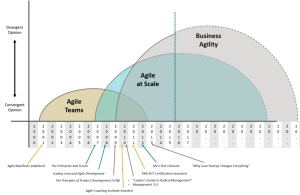 Other organizational departments eventually understood the benefit in communication clarity and flexibility, as well as freedom and ownership, so “scaled agile” was introduced to companies, to be used by every department, across the whole organization. The benefits from improved communication as well as monitoring abilities, were just too big to ignore. With drastic and rapid changes in global markets, not only scope and requirements for one project, but business models and whole organizations need to become agile and be able to change within days. New competitors appear every day and global brands falter within weeks of the irrelevance of their products or services. The objective of “business agility” or the third wave of agile, is to transform how we charter, lead and manage organizations by shifting to an Agile mindset, fostering a culture of organizational learning, and adopting organization-wide Agile operations. Holacracy is a logical development of more effective structures and processes for continuous improvement, adaptability and self-learning. Switching to holacracy means not only to change a method or tool, but requires substantial mind shifts in each individual employee. Especially for managers letting go of control is connected to fears and resentments and the “feeling” side of change. Corporations are therefore well advised to ensure that their workforce is ready to adapt holacracy before they switch. Our research suggest to start with the employees first and establish a culture of self-learning teams first, before confronting them with new structures and processes. This way your workforce understands that they are the focus of your corporate efforts, to make their life easier and how, and to provide structures and processes that minimize conflicts, misunderstandings and false assumptions. Talk to us to find out if your workforce is ready for the “New way of working”. The Fifth Discipline: the Art and Practice of the Learning Organization. Peter Senge, 1990. Change By Design. Tim Brown, 2009. The Principles of Product Development FLOW: Second Generation Lean Product Development. Donald G. Reinertsen, 2009. The Lean Startup. Eric Ries, 2011.